We are busy making stock for CAL (Ceramic Art London). 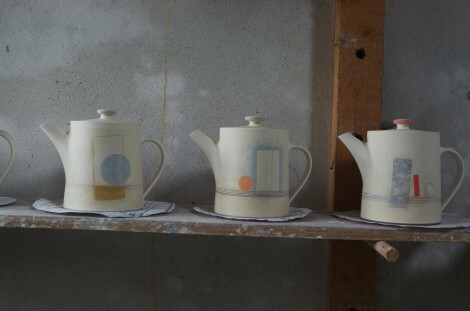 These are some decorated teapots drying before their first firing – looking promising but a long way off being “in the bag”. The functional demands on a teapot are obviously great which means they’re difficult to do well. They should pour well, feel nice to hold; the lid fit well, be light and balanced – and of course look good. They only have to fall short in one respect to be proclaimed a “second”. However, if all goes well they could be one of our best products – James’ perfectionist attention to detail in the making and my surface design – that’s collaboration. Now we just wait with fingers crossed.